Originally a Russian folk tale, this is the story of an old farmer and a turnip that grows to become gigantic. 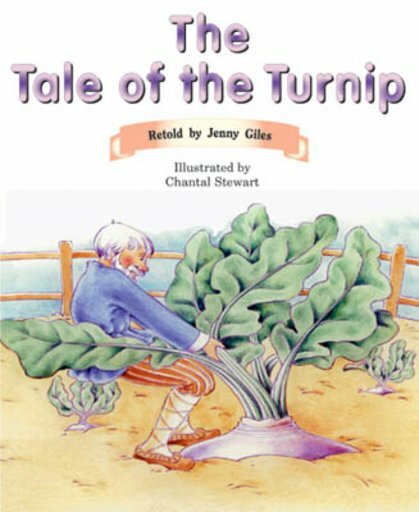 The farmer decides to make turnip soup, but cannot pull it out of the ground all on his own. Other characters, including a mouse, unite to help create a delicious ending. Orange level titles introduce new words and reinforce those already encountered. Three-syllable words are included and readers encounter different story structures – such as traditional tales and plays – to build writing skills. Available for Levels 15–24, PM Traditional Tales and Plays retell classic tales in a simplified language and form that children can understand. Teachers use the tales in guided reading sessions and children can later read them with confidence and understanding. Parts are colour-coded for easy recognition.